They are the crow Ayakashi. They were originally extremely dangerous demons and harbingers of war before they became protectors of the mountains and forests. Even as their image gradually softened, they are still regarded as very dangerous Ayakashi. They are masters of martial arts. The Daitengu are the most powerful Tengu of the clan, and live on a separate mountain to the rest of the clan. Sojobo is the name given to the King of all the Tengu, who resides and rules on Mount Kurama, north-west of Kyoto. 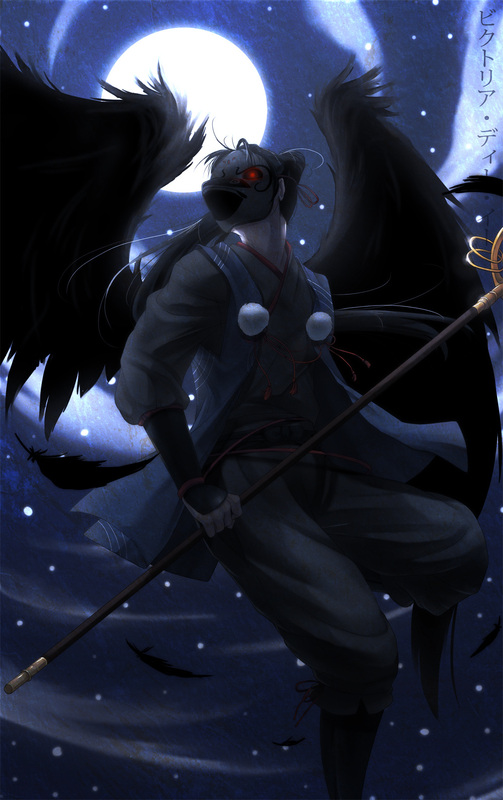 The Tengu’s original form is that of a humanoid with wings and a dark sash/scarf tied around their mouths and noses. The Tengu need only conceal their wings and the sash to look human. The Daitengu, once they complete their Seven Tests of Ordeal, develop special Abilities that are meant to aid them in their duties as Daitengu. The most volatile of those Abilities is the power to control fire (currently an Ability used by Nishimura Haru, Daitengu to the current Tengu prince Akiyama Kouta). Daitengu who control fire must, in addition to the tattoos all Daitengu have that help them control their powers, wear piercings in specific patterns on their body that allow them to put a leash on their powers. Removing these piercings removes the barrier and allows their fire Abilities let loose.